This past week I’ve actually started making things! It’s harder than I thought! The first pieces I attempted were the question mark blocks. I’d printed out a six sided cube pattern as you can see in the image below. The finished question mark blocks – not perfect but they’ll do! I was going to stick this onto a perfectly cut 44x44x44mm wooden cube that I’d cut but it didn’t go to plan. I stuck one side on the as I folded the rest sides around I realised my cubes weren’t precise enough, there were overlaps and the faces of the cube weren’t sitting straight at all. In the end I decided to cut out each face as a separate piece that was slightly smaller than the wooden block face. I then painted the cube yellow so that when I stuck them on the gaps between the paper squares would blend in. They turned out pretty well I think! The oil barrels have come out pretty well. I used purple paint on the end of the oil barrels – this was a lot easier than trying to cut a perfect circle to stick on the top. I’ve not quite matched the colour perfectly but it’s close enough that I can live with it. I stuck the oil barrel design onto the 35mm diameter wooden dowels after painting the ends using a good quality PVA glue (same glue for the ? blocks). One thing I found is gluing both the wood and the paper with thin layers and going right to the edges helps. This way you get a much stronger hold than if you glued just one side and going right to the edges means no flappy bits for a 2 year old to start peeling off! I’ve tried experimenting with the paint for the main body of the garage this week as well. The two main effects I’m trying to achieve are an asphalt effect for the ground and a white washed wooden board effect for the walls of the garage - as it is on the Mario Motors building. A closer look at the wooden boards that form the main body of Mario Motors. After a few different tries at creating the asphalt look I’ve found the best way is to use a very dark blue/ black thinned paint as a first coat (I’m using watered down acrylic). Then lightly sponge on two coats of thick grey emulsion (I’m just using a tester pot so I don’t have to buy a full tin). The key is to sponge it on sparingly so that you still get some of the dark base showing through – this creates the effect of gritty asphalt. By making the base layer thinned paint it soaks into the wood meaning even if it gets a scratch the paint colour should show through instead of bare wood. The asphalt effect test piece. For the wooden board effect I’ve used a base layer of thin white acrylic – again so it soaks in and stains the wood. Then I’ve covered that with thick white acrylic and while the paint is still wet I’ve scored lines into it (not very neatly in the test but they will be straight in the final version). I then gave it a wash over with thinned brown acrylic which I wiped off immediately with a paper towel. The key to achieving the effect is to wipe the white parts with the towel and to leave the brown colour to settle and dry into the scored areas. This gives the board effect I was hoping to achieve and makes it more 3D that just a line being painted on. I think I’ll use a black/ brown for the final version though as the brown just isn’t dark enough. The wooden board effect test piece. I need to start decorating the new baby’s nursery this weekend so I’m not sure how much I’ll progress with the garage over the next week. Hopefully I’ll have an update soon as making this is way more fun than decorating! 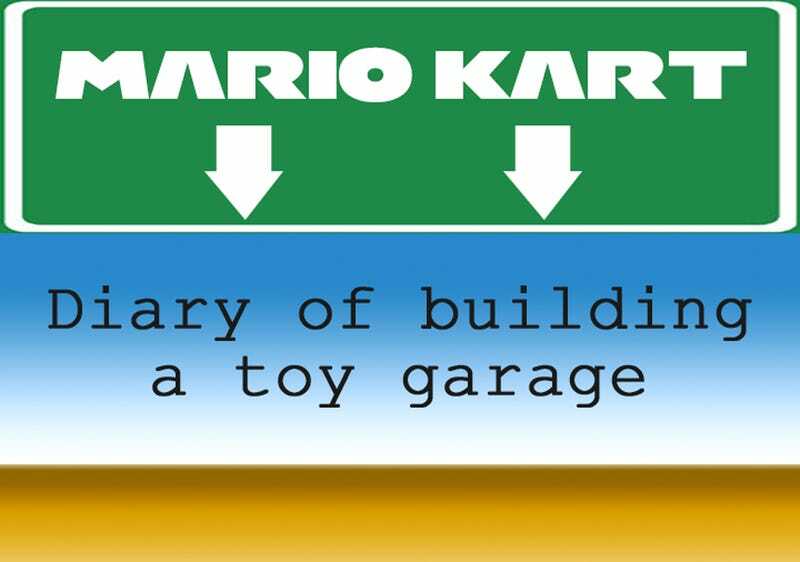 Mario Kart Toy Garage – A Build Diary - Finished!